A Daily Diary: Lost My Wallet and Found a Blessing. Lost My Wallet and Found a Blessing. 2:21 p.m. I went and got x-mas gifts...one of which is bought on credit and will be paid for with a dollar to a little shop later. Long story short, I lost my wallet while buying stocking stuffers at Dollar General. I came home and found out, then got a ride from a neighbor to look for it. When we couldn't find it, we almost went to the police station when Rob called and said the police were there with it...because I left it at the dollar store. I was praying the whole time and Praising the Lord!! He does miracles!! I came home and stuffed stockings and wrapped presents and now just want to chill....Oi Vey? Right? Oh, I also got garland for the tree because we needed some. Rob and April have stockings now, much to April's surprise and bonus! My food stamps are renewed. WHEEEWWW!!!!! :D Good things, good blessings. God is amazing. There ya go. Glory, Praise, Thanks, to Him on the Highest forever and ever in Jesus Name, Amen, who Died, Rose from the Dead, and Saved us! Yay! P.S. April is finally coming home tonight. 6:16 p.m. Almost four hours later. I had some tacos and went to bed. I woke up to find April was home and we discussed Costco, Christmas plans, and taking care of a place after lice. I'm still drowsy. The Abilify has not stopped my issue, or slowed it down, but it's best at making me sleepy. Probably because this is a spiritual issue more than a mental one. End satan and then this ends, you know? If I grow old and die first before it does, then let it be. 8:49 p.m. Anyway, I chatted up the neighbor, named Marina, with April and Rob a while before coming home and enjoying neopets, popcorn, and potatoes. We're all good for Sam's Club tomorrow. God provided a wonderful miracle today, getting my wallet back. Bless the good Samaritians in Jesus Name, Amen! God is Able! 9:28 p.m. The nice lady at the thrift shop gave me this awesome pocket book which I wanted to keep stuff in. She wouldn't take my credit card for a dollar purchase and I didn't have cash. So, she insisted I take it and bring the money back next time I come by. Which I will because April so kindly alloted me this dollar and I let myself glue some strechy stuff in it to hold more stuff and I'm super thankful to God for all this. Instead of biking, I want to see if I can get a ride tomorrow though, just for that quick run. :D God Bless, Jesus Loves, Lives, Saves! All Glory, Praise, Thanks, and all things be to God on the Highest forever and ever in Jesus Name, Amen! God is Able! 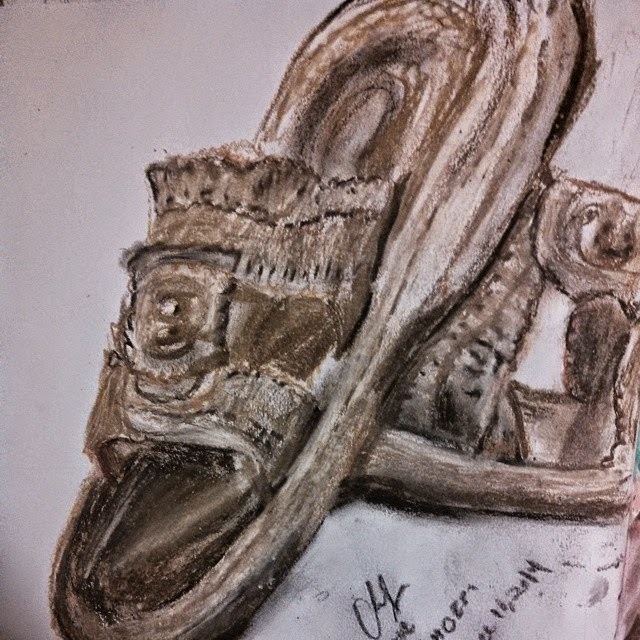 I give you...my old worn sandals. lol. 11:43 p.m.I just decorated the posket book with glitter and my sketchbook with lace. I hung Christmas cards and sent out one of my own to Anne...as much as I wanted to draw JRM in it, I didn't have the 'energie' JRM fans get the joke. :P I hope. I've been listening to music as well.